To combat starvation in Europe during World War I, President Woodrow Wilson created the United States Food Administration by executive order. Under the direction of Herbert Hoover, it became one of the most efficient and successful governmental initiatives in American history. More than 5 million Russians died of starvation before food aid was allowed in 1921. HERBERT HOOVER. 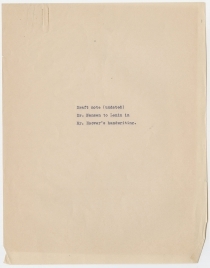 Autograph Note, undated [April, 1919]. 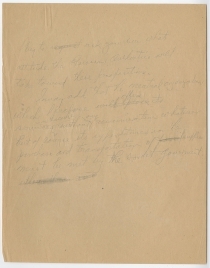 Cover sheet: “Draft note (undated) / Dr. Nansen to Lenin in / Mr. Hoover’s handwriting.” 1 p., 8¼ x 10½ in. 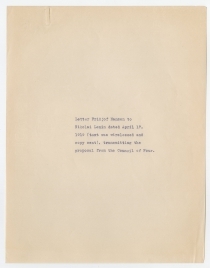 #24849 With FRIDTJOF NANSEN, Typed Letter Signed, to VLADIMIR LENIN, Paris, France, April 17, 1919. 4 pp., 8¼ x 10¾ in. 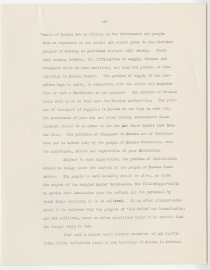 This compound letter includes Nansen’s proposal for Russian relief to the Big Four allied leaders, their response, and his proposal to Lenin. It is a remarkable compilation of the prospects for and obstacles to efforts to ease Russian suffering. Although Norway, like Sweden and Demark, declared its neutrality during the war, its loss of overseas trade led to food shortages. In 1917, Norway sent explorer and scientist Dr. Fridtjof Nansen to the United States, where after months of discussion, he obtained food supplies in return for the establishment in Norway of a rationing system. In Russia a pair of revolutions in 1917 left the Bolsheviks led by Vladimir Lenin in power, and Lenin ended Russian participation in World War I by March 1918. Civil war erupted within Russia, which continued for several years, but the Bolsheviks emerged victorious as the Communist Party, which led to the creation of the Union of Soviet Socialist Republics in 1922. By the spring of 1919, Russia had been out of the war for a year, but the civil war created havoc, and millions neared starvation. 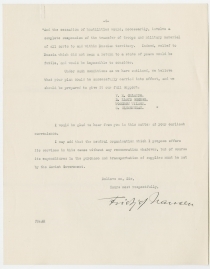 Hoover needed a “neutral executive” like Nansen to serve as an intermediary with the Russians. 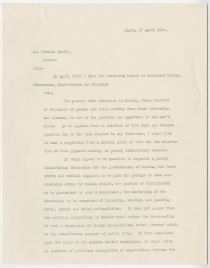 On April 3, Nansen sent a letter (drafted by Hoover), to President Wilson and the other members of the Big Four, proposing the plan and, after obtaining approval, wired the offer to Lenin on April 17. 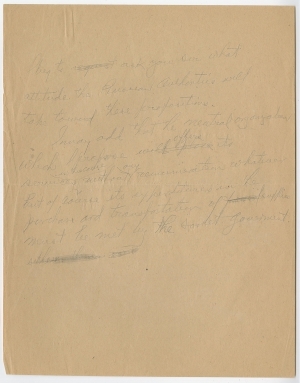 The second paragraph of this page of draft notes appears verbatim as the last paragraph of Nansen’s letter to Lenin. The French, unwilling to do anything to keep the Bolsheviks in power, never sent Nansen’s telegram to Lenin. The offer was resent, by radio on May 3. The Russians’ response on May 14 was also blocked by the French, but picked up by radio and relayed to Hoover. Russia’s refusal to stop fighting until they had achieved their objectives blocked the proposed plan. Two years later, an even deeper famine struck Russia. By the time it was over, it killed more than 5 million people, primarily in the Volga and Ural River regions. Unlike in 1919, Lenin allowed outside aid, or the death toll would have been even more horrific. In August 1921, the International Committee for Russian Relief (ICRR) was organized in Geneva, with Nansen as its High Commissioner. Hoover’s American Relief Administration provided the bulk of the aid that went to Russia during 1922 and 1923, but the ICRR fed hundreds of thousands as well. These documents illuminate an incredible period of world history, bridged here briefly by a single man, with no agenda other than a humanitarian desire to feed the starving. Vladimir Lenin (1870-1924) was born Vladimir Ilyich Ulyanov to a wealthy, middle-class family in Simbirsk. After his brother was executed in 1887 for attempting to assassinate the emperor, Lenin turned to revolutionary socialist politics. Arrested for sedition in 1897 and exiled for three years, he later moved to Western Europe, where he became a prominent political theorist. He hoped that World War I would turn into a European proletarian revolution, and when the February Revolution ousted the czar in 1917, Lenin returned to Russia. He played a leading role in the October Revolution and led the Bolsheviks, who by 1918, had concentrated power in the Communist Party. Lenin redistributed land among the peasantry and withdrew Russia from the war. He suppressed opponents in the Red Terror, which left tens of thousands dead or in concentration camps. He led the formation of the Union of Soviet Socialist Republics in 1922. Succeeded by Joseph Stalin, Lenin became an international symbol of the communist movement throughout the twentieth century. Fridtjof Nansen (1861-1930) was born in Christiania (now Oslo), Norway, and became a champion skier and ice skater. He was an explorer, and led a North Pole expedition from 1893 to 1896. He studied zoology and his study of the central nervous system of marine creatures earned him a doctorate. He made many scientific cruises in his study of oceanography. From 1906 to 1908, Nansen served as the Norwegian representative to the United Kingdom. He devoted himself to the League of Nations, securing Norway’s participation in 1920. At the League’s request, he organized the repatriation of half a million prisoners of war, including 300,000 in Russia. Nansen received the 1922 Nobel Peace Prize for his work on behalf of World War I’s displaced persons. “I beg to request ask you sir what attitude the Russian Authorities will take toward these propositions. 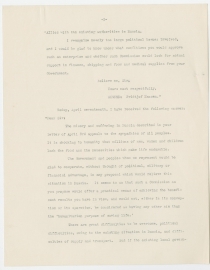 Fredtjof Nansen letter to Lenin is transcribed below. The present food situation in Russia, where hundreds of thousands of people are dying monthly from sheer starvation and disease, is one of the problems now uppermost in all men’s minds. As it appears that no solution of this food and disease question has so far been reached in any direction, I would like to make a suggestion from a neutral point of view for the alleviation of this gigantic misery, on purely humanitarian grounds. It would appear to me possible to organize a purely humanitarian Commission for the provisioning of Russia, the food-stuffs and medical supplies tobe paid for perhaps to some considerable extent by Russia itself, the justice of distribution to be guaranteed by such a Commission, the membership of the Commission to be comprised of Norwegian, Swedish, and possibly Dutch, Danish and Swiss nationalities. It does not appear that the existing authorities in Russia would refuse the intervention of such a Commission of wholly non-political order, devoted solely to the humanitarian purpose of saving life. If thus organized upon the lines of the Belgian Relief Commission, it would raise no question of political recognition or negotiations between the <2> Allies with the existing authorities in Russia. I recognize keenly the large political issues involved, and I would be glad to know under what conditions you would approve such an enterprise and whether such Commission could look for actual support in finance, shipping and food and medical supplies from your Government. The misery and suffering in Russia described in your letter of April 3rd appeals to the sympathies of all peoples. It is shocking to humanity that millions of men, women and children lack the food and the necessities which make life endurable. There are great difficulties to be overcome, political difficulties, owing to the existing situation in Russia, and difficulties of supply and transport. But if the existing local governments <3> of Russia are as willing as the Governments and people whom we represent to see succor and relief given to the stricken peoples of Russia, no political obstacle will remain. There will remain, however, the difficulties of supply, finance and transport which we have mentioned, and also the problem of distribution in Russia itself. The problem of supply we can ourselves hope to solve, in connection with the advice and cooperation of such a Commission as you propose. The problem of finance would seem to us to fall upon the Russian authorities. The problem of transport of supplies to Russia we can hope to meet with the assistance of your own and other Neutral Governments whose interest should be as great as our own and whose losses have been far less. The problem of transport in Russia and of distribution can be solved only by the people of Russia themselves, with the assistance, advice and supervision of your Commission. Subject to such supervision, the problem of distribution should be solely under the control of the people of Russia themselves. The people in each locality should be given, as under the regime of the Belgian Relief Commission, the fullest opportunity to advise your Commission upon the methods and the personnel by which their community is to be relieved. In no other circumstances could it be believed that the purpose of this relief was humanitarian, and not political, under no other conditions could it be certain that the hungry would be fed. That such a course would involve cessation of all hostilities within definitive lines in the territory of Russia is obvious. <4> And the cessation of hostilities would, necessarily, involve a complete suspension of the transfer of troops and military material of all sorts to and within Russian territory. Indeed, relief to Russia which did not mean a return to a state of peace would be futile, and would be impossible to consider. Under such conditions as we have outlined, we believe that you plan could be successfully carried into effect, and we should be prepared to give it our full support. I would be glad to hear from you in this matter at your earliest convenience. I may add that the neutral organization which I propose offers its services in this cause without any remuneration whatever but of course its expenditures in the purchase and transportation of supplies must be met by the Soviet Government. Herbert Hoover (1874-1964) was born in Iowa into a Quaker family. Both his parents died before he was ten. He lived with relatives in Iowa and Oregon, then becoming one of the first students of newly established Stanford University. He graduated in 1895, and worked as a mining engineer in California, Australia, and China. He became an independent mining consultant in 1908 and traveled the world until the outbreak of World War I. When World War I began, he helped organize the return of 120,000 Americans from Europe, and spearheaded humanitarian relief efforts in Belgium, from his base in London. After the United States entered the war, President Woodrow Wilson appointed Hoover to head the U.S. Food Administration. He lobbied for the job and agreed to accept no salary. After the war, the U.S. Food Administration became the American Relief Administration, which, at its height, fed 10.5 million people daily. Elected President of the United States in 1928, Hoover took office less than eight months before the Wall Street Crash of 1929 plunged the nation into the Great Depression. Franklin D. Roosevelt defeated Hoover’s 1932 bid for reelection.